Fans of all ages are invited to Dave and Buster’s in Milpitas, CA to meet and get autographs from some of the top names in all of mixed martial arts. Fans will also have the opportunity to win tickets and great prizes, as well as snap a photograph with the Bellator ring girls. One of the most recognizable MMA fighters of all time, Hall of Famer Randy Couture transitioned nicely into the entertainment world after his fighting career, starring in several television shows and movies, most notably the Expendables franchise and Dancing with the Stars. Inside the cage, Couture was a fearless underdog, often defeating men with great size advantages. “The Natural” was a multi-time heavyweight and multi-time light heavyweight champion in the UFC. If there is one legend in attendance who knows a thing or two about kickboxing and MMA, it’s Cung Le. Born in Vietnam, Le fought 17 times around the globe and never lost before making the leap from kickboxing to MMA, where he won the Strikeforce middleweight championship. From there, the San Jose, Calif. – based fighter would continue to expand his recognition past the world of combat sports, starring in multiple feature films. Le remained competitive into his 40’s, finishing Rich Franklin in what was unanimously considered the 2012 knockout of the year. 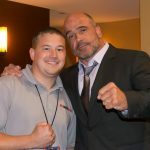 A legend in the heavyweight division, Mark Coleman was the UFC 10 and UFC 11 tournament champion, the promotion’s first Heavyweight Champion, and the Pride Fighting Championships 2000 Open Weight Grand Prix champion. The accolades don’t stop there; Coleman represented the United States at the 1992 Summer Olympics and won gold medals at the Pan American Championships in freestyle wrestling in 1990, 91 and 92. FIGHT INFO: “Bellator 154: Davis vs. King Mo” takes place on May 14, and airs LIVE and FREE on SPIKE at 8 p.m. ET/7 p.m. CT and features a light heavyweight main event of Phil Davis versus King Mo. Tickets start at just $30 and are on sale now at Bellator.com, Ticketmaster, and the SAP Center Box Office.